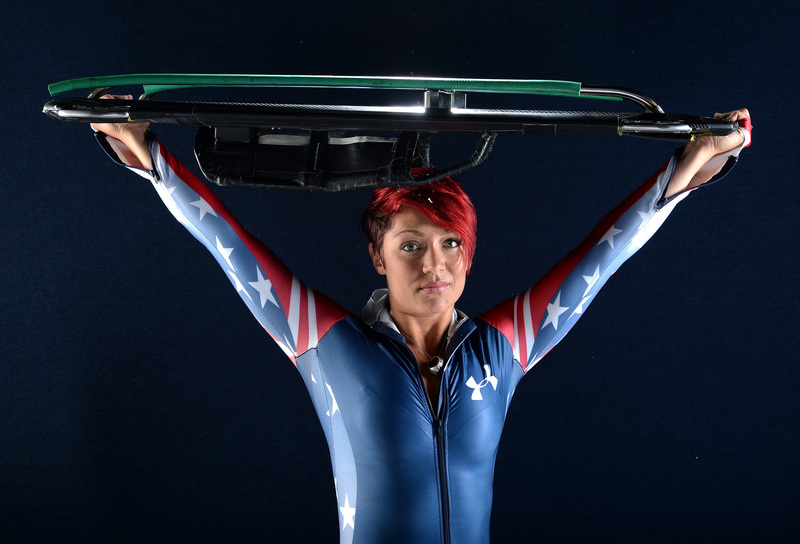 Ladies and germs, Betties and Baldwins, meet your new favorite badass Olympic hero, Team U.S.A.'s Katie Uhlaender. Katie is a 5’3” 135 lb. powerhouse 2012 Skeleton World Cup Champion with all eyes on her. Skeleton is the terrifying, mind-boggling, actually nerve-wracking-to-watch sport that entails athletes shooting face-first, stomach-down, inches above the ice down a curvy and steep track on a one-person sled. In fewer words, it is not a sport for the faint of heart. Nor a sport fit for anyone who can’t deal with flying up to nearly 100 mph... oh, heavens, my palms are sweating just typing that. Moving on! Her father Ted Uhlaender was a pro baseball player. Uhleander competed for a spot in the 2010 London summer Olympics. Though she didn’t make it on the US team, her near-qualifying results made her one to watch. Her favorite book of all time is The Fountainhead. Discuss. Katie competed in the skeleton at the 2006 and 2010 Olympics finishing 6th and 11th respectively. Bring on the medals, Sochi. When Katie was just out of high school, she started training for a slew of winter sports with a friend at her local gym. When first introduced to skeleton, the Olympian remarked, “[I thought] it could be a once in a lifetime opportunity just to try it, so I went and tried it and then three weeks later I was a national champion — the junior national champion. I went to worlds for juniors and then came back and won nationals. So I was like, ‘Do I get a PhD and become a primatologist like Jane Goodall or Jeanne Altmann — I wanted to study gorillas — or do I become an Olympian?' Olympian, for some reason, had a better ring to it, so I went, and three years later, I was an Olympian." As the turn was dubiously nicknames on a training course in Lake Placid. While rounding about this past fall, she smacked her head on a wall, and has thankfully recovered from a gnarly concussion. I guess they don’t call it skeleton for nothin’.